Occasionally we need activities that are totally independent and Mightymind fits the gap perfectly. 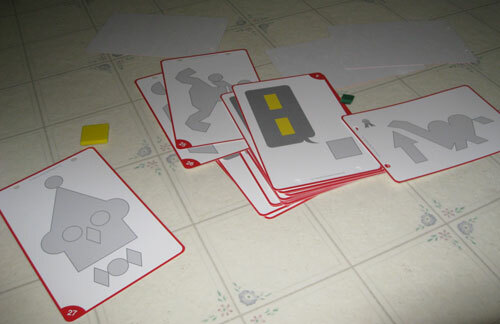 The first cards explain exactly what is needed and require the child to place the needed tiles on the speech bubble. 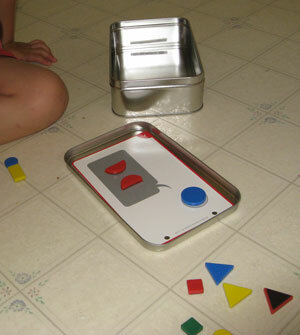 They then decide how to make a shape using the chosen tiles. Here Daisy is beginning at the card labelled clearly with a 1. She could read numbers at this point but for prereaders I would have the cards in order so they could work their way through in a logical sequence. 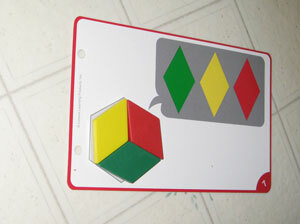 The next puzzle had an option; choose a yellow square or two yellow rectangles. And make a larger rectangle. The puzzles are getting more complicated. 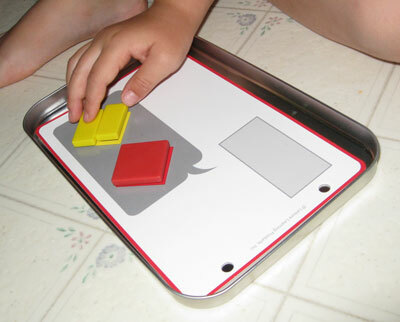 Required tiles are still needed in the speech bubble but more problem solving is needed. As the cards progressed, the puzzles became more challenging and the speech bubbles disppeared so Daisy had to chose the tiles heself. 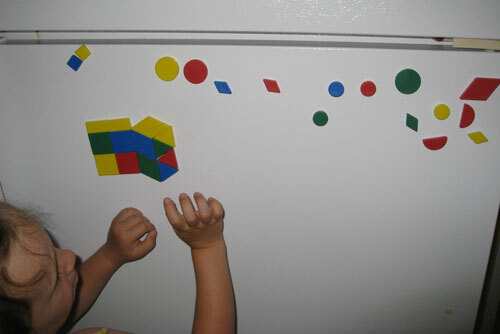 Free form desgn on the fridge was also fun. Mightymind is a problem solving geometric activity which is beautifully set up to gradually release responsiblily and encourage independent thinking. It is a puzzle that Daisy continues to come back to although she is now ready to move unto the challenge of Magnetic Supermind she still enjoys Mightymind. 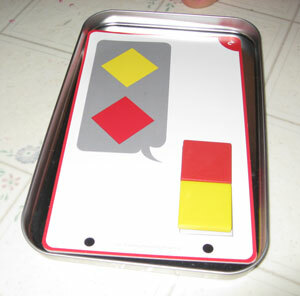 The 30 puzzle boards are made from sturdy card and have no language, pefect for prereaders. Tell us what your favourite puzzle is on Quality Classrooms facebook page. Visit Quality Classrooms website and come back and tell us what your favourite puzzle is. Before Monday 25th February 2013, 4pm Central Time. Letter Formation using Sky, Grass and Dirt. I’ve been eyeing this puzzle set for a while now. I’d absolutely love to have it to add to my collection. The kids love all sorts of puzzles, but I like how this one allows for both free-form expression and more structured learning, and works for so many different ages and stages. It is very versatile Chelsea. Good luck! Chelsea the Magnetic Mightymind Puzzle set is yours! Email chris@qualityclassrooms.com with your address and we will get it off to you asap! Wow, thank you so much! Tomorrow is my birthday – what a lovely surprise. I’m (I mean the kids :)) so excited to try it out.